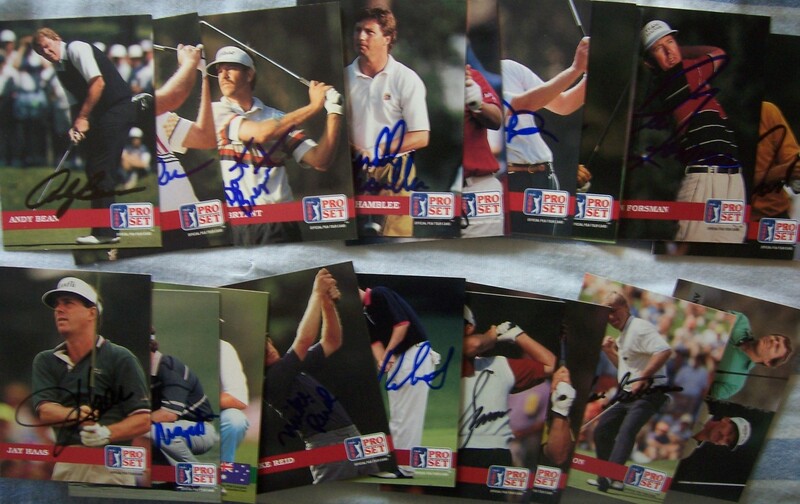 Lot of 64 different autographed 1992 Pro Set golf cards (various pens) including 22 major champions Davis Love III #3 (heavy crease), Hal Sutton #9; Steve Jones #28, Steve Elkington #31, Mark Calcavecchia #61, Mark Brooks #71, Larry Nelson #98, Jeff Sluman #99, Scott Simpson #103, Larry Mize #105, David Toms #156 (his Rookie Card), Ben Crenshaw Stat Leader #183, David Graham #188, Charles Coody #203, Al Geiberger #219, Bob Charles Stat Leader #275, Sandy Lyle #E3, Ian Woosnam #E4, Vijay Singh #E6 (his Rookie Card), Jose Maria Olazabal #E9, Bernhard Langer #E11 and Nick Faldo #E15. Both Jim Colbert autographed cards are personalized To Greg, and Brandel Chamblee #132 has a heavy crease. All autographs obtained in person at PGA Tour or Champions Tour events. With certificate of authenticity from AutographsForSale.com. Cards average ExMt/NrMt condition due mostly to corner and edge wear. ONLY ONE LOT AVAILABLE FOR SALE.